Saturday morning at LIFT Asia 2008, quick notes. Frederic Kaplan began his talk by stating that the number of object we have at home is huge (nearly 3500), all of them have different “value profile”. he showed curves that capture the evolution of the experienced value of an object). See the curve below. 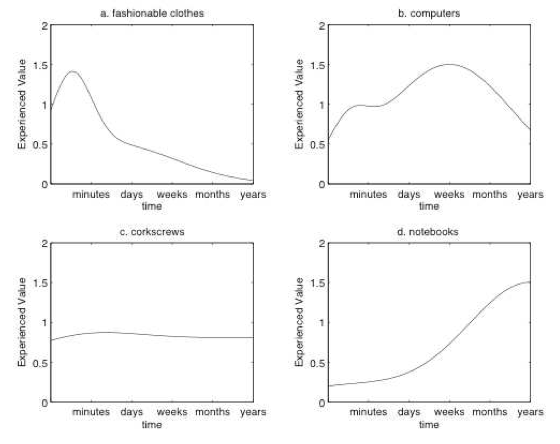 A roomba for example follows a curve such as a corkscrew (c) whereas an Aibo, an entertainment robot, follows more a “notebook” curve: where value augment over time through the relationship with the owner(s). Frederic stated how we know how to deal with the mid to end part of the curve but not the beginning, namely how to create the first part of the robot-owner relationship, which is a crux question in general for robots/communicating objects designers. There are many reasons for that: in the west, it’s not easy in the occidental culture, to “raise” and talk a robot; most people try but stop, and show it only when friends come visit. So the robot is a pretty expensive gadget. After moving from Sony to the CRAFT laboratory, Frederic started moving form robot to interactive furnitures and became interested in how objects can be “robotized” and the fact that perhaps robots should not always look like robots. Since 1984, computers have not changed much (shapes, icons have been modified but still it’s always the same story). We changed the way we used computers (listen to music, watch photos, get the news, that was not what computers were intended for) but they did not change, so they thought it would be an idea to build a robotic computer as in the former Apple commercial. 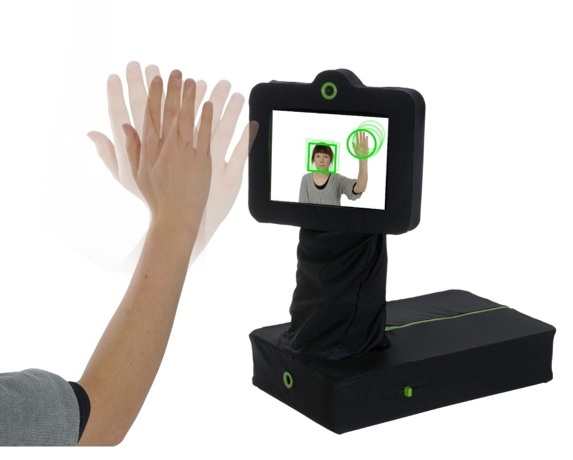 They therefore designed the Wizkid, an “expressive computer” which recognizes people, gestures proposing a new sort of interactivity with people. To some extent, he showed how you can have expressivity without any anthropomorphic robot (unlike the demo we had of the Speecys robot). - in the living room, the Wizkid can act as a central interface to the media players: showing a CD make the robot playing it; it can also take pictures autonomously and create a visual summary of the event that can be sent to guests afterwards. It’s like an automatic logging system that remembers and use that information. - in the kitchen: the wizkid can help you cook and shop. When the owner prepare a recipe, the wizkid will help following it step by step, tracking face and gestures (ans also doing some suggestions). It would be possible to show an item and the wizkid add it to the shopping list. - games are also an interesting field: you can play augmented reality games with the wizkid: you look at yourself in the screen and see yourself in imaginary worlds. As a conclusion, Frederic said that most people things that robots will look like objects but he claims that everyday objects can become robot and the next generation of computer interfaces will be robotic. People used to go to the machine to interact but now interactivity comes to you. Computers used to live in their own world, now they live in yours. Then Bruno Bonnell in his “from robota to homo robotus: revisiting Asimov’s laws of robotic” took up the floor and gave an insightful presentation about robot designers should revisit the definition of “robots” (and therefore Asimov’ laws). To him, there is a vocabulary problem when it comes to robots. In Czech, “robot” means “work” and it pervaded our representation of what is a robot, that is to say, a mechanic slave. Hence the laws of robotics for Asimov. These laws work well for military or industrial robots but what about leisure robots such as the Aibo, the roomba, iRobiq? We had the same problem with the word “computer”. it’s only since World War II that the word “computer” (from Latin computare, “to reckon,” “sum up”) been applied to machines. The Oxford English Dictionary still describes a computer as “a person employed to make calculations in an observatory, in surveying, etc.”. We moved that into machines and computers took over the successive activities: Systematic tasks, support creation tools, became and artistic Medium and finally an amplifier of imagination. And it’s the same with animals: it used to be food, then working forces, companions and finally friends. In addition, we don’t talk just about “animals”: there are ponies, dogs, etc. with a classification: animals, mammals, equids, horses. It would be possible to classify computers according to the same classification: order/family/genre/specy. So, what about robots? are the very different robots all the same? Couldn’t we classify them in a classification: a family of static robot, a family of moving robot, etc. So now, it’s no more “robot, robot, robot” but “Robots,Mover,Humanoide,IrobiQ”. What is important here is that all these robots in the classifications are recognized as having different features and characteristics. We start recognizing that they are all not the same species. By classifying (giving a name), you generate some different applications and can improve the quality of the product that you are designing. Putting names on things helps creating them. It allows to go beyond the limits of the robot vision: and it allows to reconcile the vision of having of both an anthropomorphic robot (like Speecys’ robot we saw first) and a different one (like Frederic’s Wizkid) since they are from two different “species”. After this classification, we can go into the evolution, how to branch out the future of robots. there could be the following path: mechanical slave, the alternative to human actions, the substitute of human care, the companions and finally the amplifier of human body and mind. Is it scifi or Reality ? Today or Tomorrow ? Is it possible technically? We don’t know but what is important is to start today and look ahead? An interesting path to do so is to move away from practical robots and investigate useless robots, as well as not being afraid of technical limitations (think about the guys who designed Pong at Atari). To the question “what does the robot do?”, the answer is simple: to create an emotional bond with humans (that would be recipe for a robot success). The important characteristics are therefore: fun, thrilling, etc. Which is very close to video games do: they creatine a emotional bond with the players because they are faithful to a reality, they are reliable, available, adaptable, and above all TRUSTFUL. In the same fashion, robots should be trustful. The bottom line is thus that we should forget the Asimov laws and invent the Tao of robotic where the “gameplay” is the key to accept them as part of our reality. Also, the funny part of the session was the first talk where Tomoaki Kasuga’s demonstration of his robot, which “charm point” is the hip (or something else as attested by the picture below), especially when dancing on stage. What Tomoaki showed is that expressivity (through dance, movement, the quality of the pieces) is very important for human-computer interaction.